You are here: Home / Family health / Oh baby, those teeth HURT! I think we can all agree that teething blows. Nobody enjoys it. Not baby. Not Mum or Dad. Not siblings. Nobody. It’s rough. These symptoms can last just days, or drag on for weeks. If your baby is experiencing one or more of the above, but you’re unsure whether he or she’s teething – especially with fevers or if digestive upsets such as diarrhoea persist – it’s worth having a health check, to rule out illness or infection. 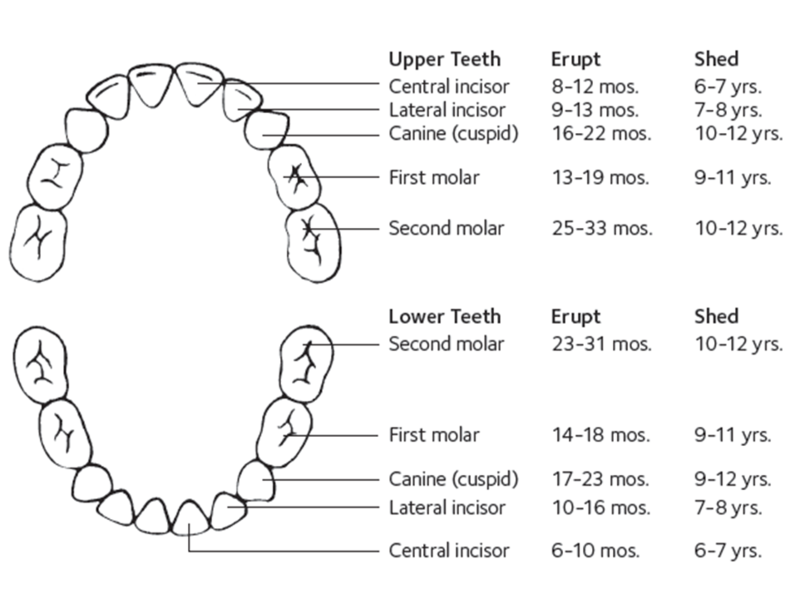 This gives you an idea of when and where teeth will appear, but bear in mind it’s a guide only and your baby might be different. Most teething remedies are intended to ease symptoms and help your baby feel more comfortable, particularly when he or she is in pain. I have a few tricks up my sleeve, which I’ll share below, and I’m happy to report that these have proven useful with my own daughter. However, I must say, some things have worked better than others at different stages – what’s important is adapting to the needs of you and your little one at the time. For example, at the moment we’re dealing with Molly’s molars and these are causing her the most discomfort of all her teeth to date. Our usually cheery little poppet is much more prone to cranky outbursts and actually pulls on her mouth in frustration and pain. 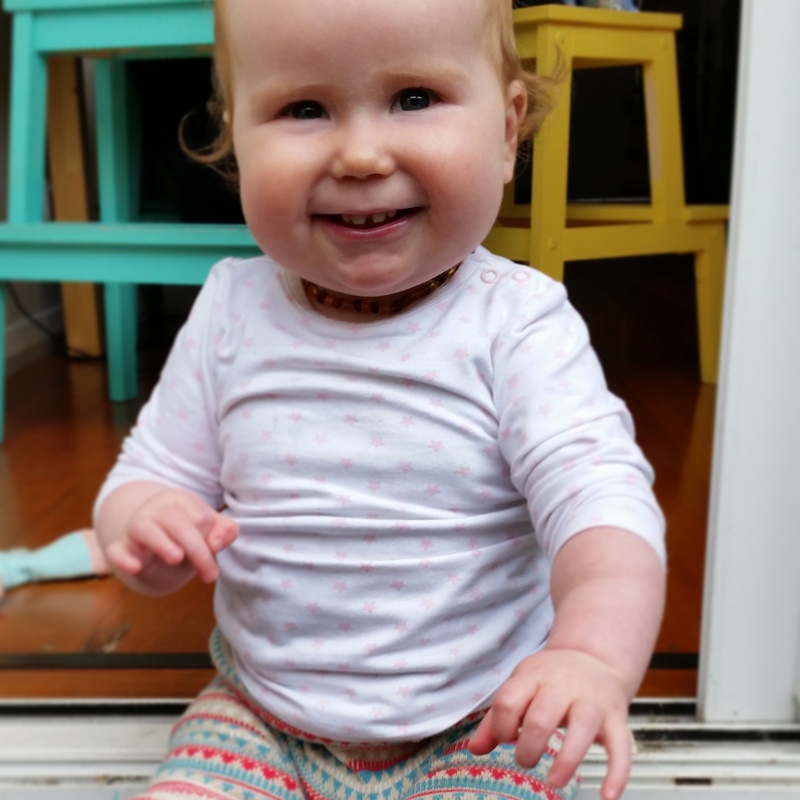 Her gums are visibly swollen, which hasn’t happened before, and she currently loves chewing on frozen teething rings or veggie / fruit sticks straight from the fridge – neither of which interested her much during previous teething episodes. Her ‘usual’ teething symptoms of very wakeful nights and much more frequent nursing continue as ever… While she seems to have outgrown her previous tendency to loose and very acidic poos in the week or two before cutting a tooth. As I say, always changing! Cranky!? Who meeeEEEeeee? … Yes darling. You. Pressure on the gums can help to relieve the ache of new teeth and cold or frozen things will help to numb the area. Wooden spoons are an original and consistent favourite, but we’ve also had success with specifically designed chew toys made from natural rubber and/or wood. Cold raw carrots, strips of cucumber and piece of apple from the fridge are great, and were particularly beneficial with Molly’s very first teeth. Mesh feeders can be used with babies who aren’t on solids yet (to avoid risk of choking), which you can fill with frozen fruit and veggie pieces or ice cubes. A frozen cloth, such as a face washer, can also work wonders ? especially if you knot the ends (all the better for chewing) and soak it in a strong brew of chamomile tea (all the better for calming) before putting it in the freezer. If you’re not breastfeeding, skip over this one. If you are, read on. Babies and toddlers often want to nurse more frequently when they’re teething and there’s no reason to refuse them. Nutritional benefits of breast milk aside, breastfeeding and skin to skin contact exert a calming effect on infants; and more calm = less stress = less inflammation = less pain. The power of a loving embrace cannot be underestimated. As mentioned above, close and skin-to-skin contact is calming for babies; not to mention delicious for parents and carers (I love sniffing Molly’s fluffy little head… even at 4am I just love it). However, sometimes it’s not practical to go on a cuddling jag, as there are things that need doing, other children that need tending to, etc. This is where babywearing – in a sling or structured carrier – proves itself to be an excellent practice (as always): this way you can keep your little one close, but still have hands free to do other ‘things’. Look, I’m not totally sold on the efficacy of amber necklaces. Some people swear by them, but as far as I’m concerned, jury’s out. However, as you’ll probably notice in the picture above, my daughter wears one. For Mol, it may offer some relief – I notice small but not consistent relief when she wears hers. The amber is thought to release succinic acid when placed against the skin, which has an anti-inflammatory and analgesic (pain relieving) effect. Maybe. But in my opinion it doesn’t hurt, might benefit, and looks cute. There are a number of natural teething products on the market, most of which contain homeopathics or micro doses of herbs. Certain herbal medicines, such as chamomile and lavender, can be used to help calm a fussy and irritable baby; and nutritional supplements such as probiotics can help with digestive upsets. These should be adapted to you and your baby. One of the best over the counter remedies I’ve found for us – which I’ve also had great feedback on from other parents – is Weleda Baby Teething Powder. It’s a homeopathic formula dispensed in a lactose powder base. For little babies, who aren’t on solids yet, it can be mixed into a little breast milk or formula and dispensed via a spoon or medicine syringe. Older infants can just eat it off a spoon. I have found that it seems to help take the edge off pain-related symptoms. Do check with your health care practitioner before starting dosing though, to ensure it’s appropriate for your child. There is an assumption, I’ve found, that because I’m a naturopath I’m anti medication. Not true at all. I do think that non-specific dosing and / or over-medication is problematic (which also applies to nutritionals and herbal medicines, in my opinion). However, judicious and appropriate use of medication is highly beneficial. In the case of teething, paracetamol (dosed by age and weight) is a very effective pain reliever and can help when symptoms are at their worst (often at night, when there are no other distractions from the pain of teeth cutting through). It’s really important to check with your GP first, before giving any medication, particularly if your baby’s under 6 months and/or hasn’t had these medicines before. Got any hot tips yourself? What has worked best for you and your baby when they’ve been cutting teeth? Thanks Kath, great and timely tips once again. She is a stunner and I am sure she is still cute when teething.